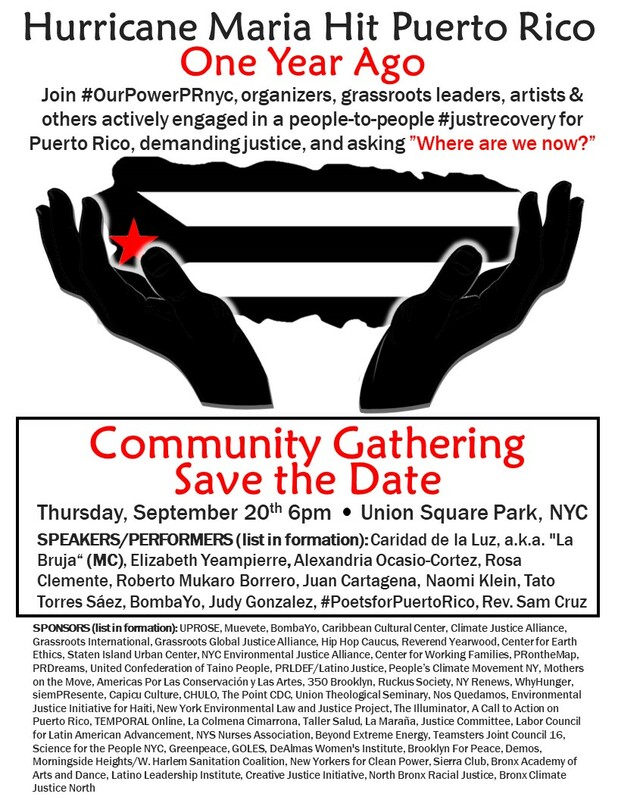 More info from UPROSE here. "Hurricane Maria landed on a legacy of austerity, neglect and colonialism in Puerto Rico and opened the floodgate to those who prosper on the pain and loss of people of color - those responsible for climate change. Climate Justice is the resistance to a history of extraction of land and labor in the Global South. We know this is a fight for our survival and we are ready." A hearing on a hotly-debated piece of legislation could determine who is really in control of city policy—Mayor Bill de Blasio or Council Speaker Corey Johnson. The City Council confirmed to Crain's that its Committee on Small Business will hold a hearing on the Small Business Jobs Survival Act near the close of October. Often described as "commercial rent control," the bill would entitle any commercial tenant who has complied with the terms of their lease to a 10-year renewal and the right to force the negotiations into binding arbitration if the new terms are contested. The 22-year-old “LLC loophole” has been a bête noire for government-reform advocates for years because it gives these companies the same rights as people. In fact, it allows firms to wield far more power than individual donors by using affiliated LLCs to write multiple checks to candidates. What’s more, while the beneficial owners of the LLCs make themselves known to the candidates themselves, the structures are so opaque that they are often impossible to penetrate for the voting public. New York’s LLC loophole—similar ones exist in five other states—defeats a basic function of the modern campaign-finance system, which is to make the source of candidates’ money transparent. When the New York Daily News laid off half of its newsroom in late July, the retreat from the outer boroughs by the city’s great daily newspapers was more or less complete. And it didn’t stop there. At the end of August, the legendary alternative weekly The Village Voice shuttered publication online—it had closed its print operation last year. Digital news organizations have proved equally vulnerable, because sustainable ad revenues online have been almost as elusive as rapidly disappearing print advertising. BAY RIDGE – On September 7, 2018, Schneps Communications bought Community News Group and associated properties, making them the largest owner of community weeklies in the city. This comes on the heels of Schneps having sold Brooklyn Reporter to the Brooklyn Eagle in May of 2018. They had shed Brokelyn even faster from the acquisition of Blank Slate (publisher of Brownstoner) in February of 2017. A non-compete from the Brooklyn Reporter sale bars the new entity from covering the same ground as their old paper, Josh Schneps confirmed. All this just means that Bay Ridge and Sunset Park will have fewer reporters covering the area, at least for a good while. It is small and cramped with over 3,000 magazines stacked all the way to the ceiling. The best sellers are lain flat on the lower ledges, while a broad array of quotidian and esoteric titles from all over the world are displayed on racks and shelves packed to the ceiling. But Mohammed and his staff know where every single title is. And if they do not carry it, which would be a surprise, Mohammed is glad to order it for you or even ship it. The daily tabloids and international papers are also on hand, along with gum, and batteries, and other daily basics. In a city that’s become increasingly expensive and homogenized, aesthetically and culturally speaking, Paradise Alley feels like an oasis of New York camaraderie—a place reflective and welcoming of its neighborhood’s vibrant, shifting population. The schedule for next month's Open House New York has just been revealed. This is a not-to-miss event. Plan your weekend now.